December is National Cat Month and as a certified crazy cat lady, I can’t think of anything better than a whole month celebrating our furry feline friends! 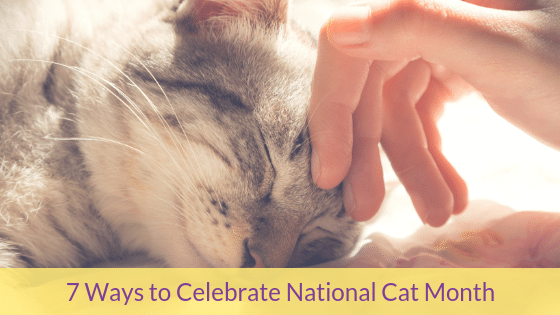 I was wondering what I could do to share this special time with my kitties to make them feel loved and appreciated so I came up with 7 of the best ways to celebrate national cat month! Take a look below. Volunteer at a local shelter or cat rescue or adopt a cat! While the number of cats and dogs in shelters is almost equal (3.2 million and 3.3 million respectively) cats are euthanized at a higher rate, almost 200,00 more per year than their canine friends. Volunteering at your local shelter will not only make you feel good, but it will also provide lonely cats with some much-needed attention and socialization, making them feel good too. If you don’t have time to volunteer, you can simply donate things like blankets, food, litter, and toys. Shelters are always in needs and any contribution goes a long way. You could even adopt a cat or kitten in need of a fur-ever home if you’re able to! Or treats, or kitty condo, or bed! Shopping for our pets is always fun but take this day to get them something extra special that you know they’ll love. Don’t be afraid to splurge! Give your kitty somewhere to look out of the window at all the birds and squirrels outside! Or build some fun shelves for them to jump around on and get some exercise. There are many cool (and stylish!) design ideas that will look amazing in your home and be fun for your cat as well. Bake and decorate some cat shaped cookies for your friends, family and coworkers, they’ll be sure to appreciate the sweet treat. You can also bake some tuna flavored cookies for your cat (they’re dog approved too), so that they can enjoy a tasty and homemade treat, too. There is no shortage of cute and funny cat videos on the internet. Binge watch videos on YouTube or Facebook with your family and friends, or even with your kitty while snuggle up on the couch! You’re sure to have some good laughs and will feel like smiling all day long. Spend some time brushing your kitty and removing and loose hair or knots they might have. It’ll help reduce hairballs and make them feel better. If you have an older cat, this will be an especially nice thing to do as older cats often have a difficult time grooming themselves as thoroughly as they used to. You can also give them a manicure by trimming their nails. Nails that are too long can result in damage to you and your cat and can get stuck in carpeting or other material. Now this may seem kind of obvious, but the best gift you can give your cat is love and affection. While cats have a limited understanding of language, they can still feel the love coming from you when you say it so don’t pass up the opportunity. In fact, why not say it to your cat everyday regardless of if it’s a holiday or not! How will you be celebrating National Cat Month? If you can’t be there to celebrate with your kitty as much as you’d like, consider hiring an Elk Grove pet sitter to stop by and give your cat some pets and playtime while you’re away!